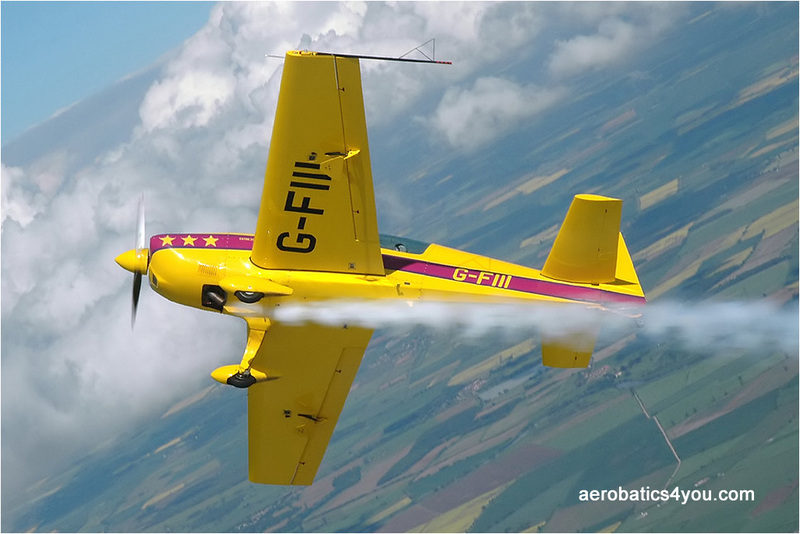 Aerobatics4you.com - Extra 260 Airshows and Air Displays. The Extra 260 came from the drawing board of designer, competition pilot and all round good guy Walter Extra in Germany in the early 1990’s. Of the four airframes built, this one is serial number 4, and I find it pretty impressive every time I see it. The aircraft is stressed to plus and minus 10g, has a roll rate in excess of 360 degrees per second, and has an initial rate of climb at sea level of around 3000 feet per minute. Fuselage construction would be familiar to anyone with experience of the Pitts Special or gliders of the Schleicher Company, being of welded 4130 tube steel with wooden stringers. The lower portion of the fuselage is fabric covered forward to the cockpit area; forward of that, it’s largely aluminium panelling: I’d like to change some of this for composite eventually, especially forward of the firewall. The upper fuselage is also composite, and together with a turtle deck, can be removed in around 15 minutes allowing easy inspection and maintenance. The wings and tail surfaces are composite with carbon spars: making the Extra 260 a very strong airframe indeed! In the winter of 2011/12 the engine was removed and sent for extensive restoration to Ronaldson Airmotive on the outskirts of Oxford. On return and reinstallation, the combination of engine and airframe now provide a performance that looks truly outstanding from both inside the cockpit and out. This is entirely down to the commitment, attention to detail and overall quality of work from Rob, Chris, Rachel and their team. 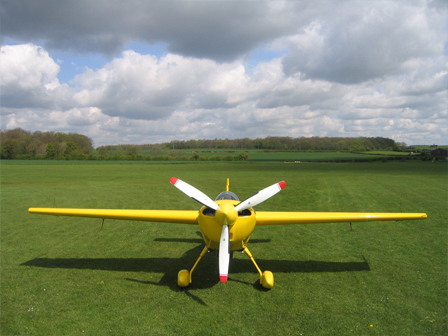 The Extra 260 is relatively easy to handle both in the air and on the ground. 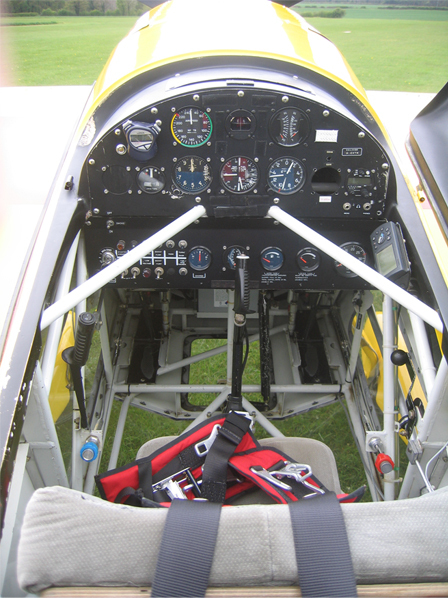 Taxiing requires plenty of weaving as the view ahead is reduced by the mid wing and high nose attitude; though anyone with some time in an RV 6, 7 or 8 would require the minimum of conversion, as has been proved more than once with this aircraft. Take off on tarmac lasts a mere 4 seconds, best said in the style of Jeremy Clarkson. Once in the air at climb power, to pilot an onlooker, performance is eye catching to say the least. Returning to the circuit after 15 to 20 minutes of aerobatics, speed can be bled off fairly quickly thanks to propeller braking and the Extra’s broad wing section. The approach can be flown with a trickle of power at around 80 Kts, with last look over the hedge at about 75. I have to say that this aircraft has been operated safely and routinely for nine years at Netherthorpe, of all places, an airfield that has two of the UK’s shortest licenced runways. As a Pitts pilot through and through, I remember first seeing this aircraft in its original factory colour scheme when Diana Britten flew it in competition. I didn’t reckon much to the colour scheme then to be honest, but despite this thought that the 260 looked very impressive, both in the air and on the ground. I’ve really enjoyed operating and looking after it ever since then and hope that you enjoy seeing it fly.